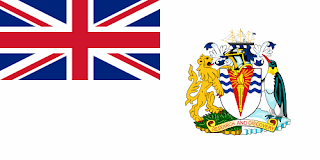 I honestly like the yellow and purple zig-zags, but the coat of arms is aesthetically bad, and makes the flag way too busy to work properly. 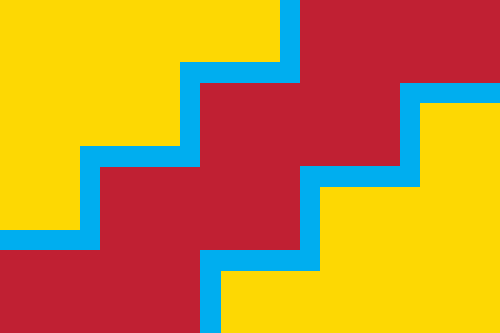 The zig-zag pattern is taken from ancient Paracas culture clothing. 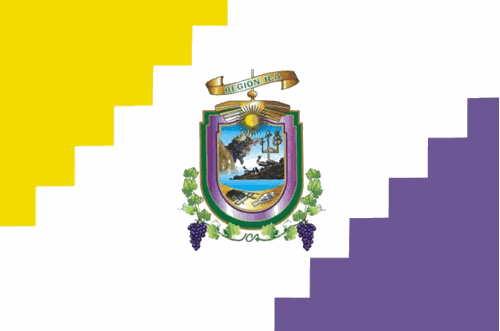 Yellow stands for the eternal sun and warmth, White stands for peace, white purple (morado) is the color of the Lord of Luren. Most of the coat of arms repeats themes from the rest of the flag: the Lord of Luren, the candlesticks of Paracas culture, the sun.. the grapes (OK, it's not represented, but the purple would work). OK, the changes aren't very radical, but I think the flag works much better now. Is anybody else noticing those dots in recently posted images ? I'm almost sure they didn't exist in original images. "Flags, etc." 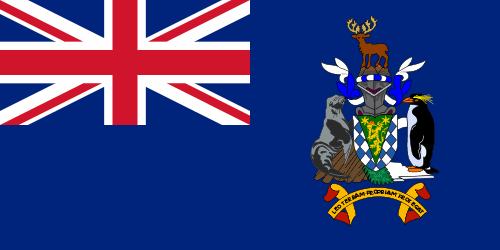 It's on the title of the blog. 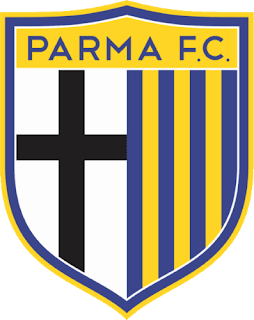 I knew that Parma FC, one of most victorious Italian football (soccer) clubs, was declared bankrupt and was relegated to the Serie D (semi-professional). If the club is acquired by another body, it wouldn't be uncommon if it was renamed and re-branded. In my futurology exercise, Parma is renamed as Associazione Calcio Parma. 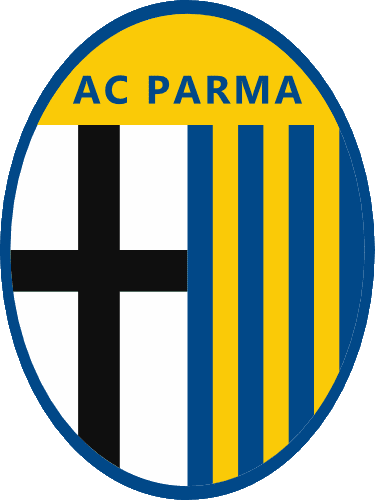 On my first attempt, I just kept the traditional black cross and vertical stripes motifs and put it on an oval, common in Italian football logos. 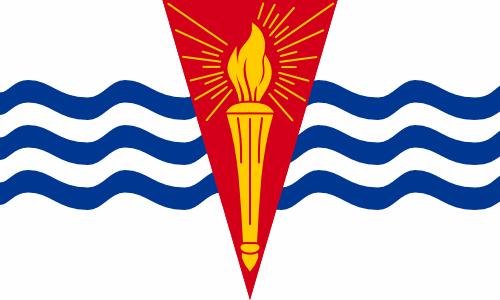 I tried other colors for border and the top section, but the best result was similar to current logo. I like the aesthetic result per se, but maybe it's too similar to rival Bologna FC 1909. 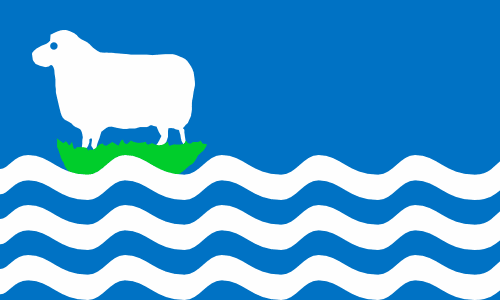 My second attempt was much more radical. 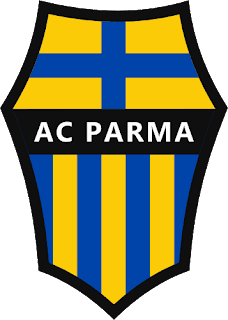 I kept the vertical stripes, but changed the color of the cross and its background: from black on white to blue on yellow, mimicking Parma city flag and coat of arms. 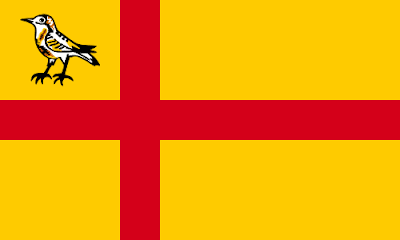 Just in case, I kept the black and white colors, now framing all the yellow and blue. 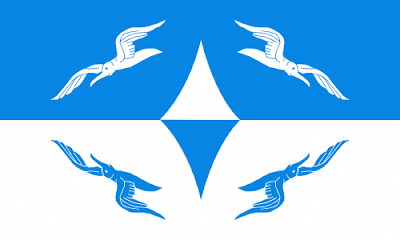 The logo shape is a typically Italian testa di cavallo. 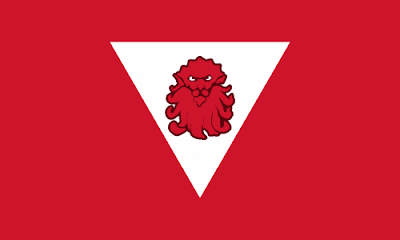 I like the way it combines local heraldry and traditional club symbols. 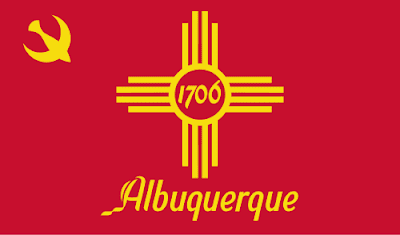 One flag-related news that trended this week is the proposal of a new Albuquerque, New Mexico flag by a local graphic designer, Gabe Re. 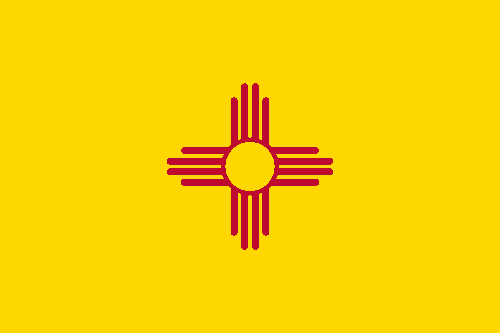 The flag is surely (excessively) based in New Mexico's, but much less effective. The lettering doesn't belong to a flag, and the thunderbird, a local symbol, is possibly more stylized than it should. You can find official rationale here. In summary, the flag is based in natural landscape, with red stripe representing muddy Rio Grande, yellow for the desert and the bottom-right zig-zag forming the mountains. The zig-zag pattern and the turquoise color (from gem) also relates to native art. 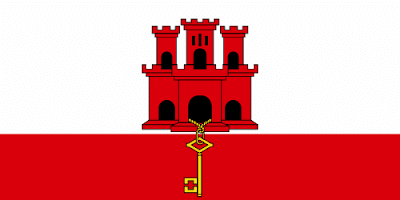 I think this design remembers more the Spanish flag, while retaining all the basic symbolism from previous flag. 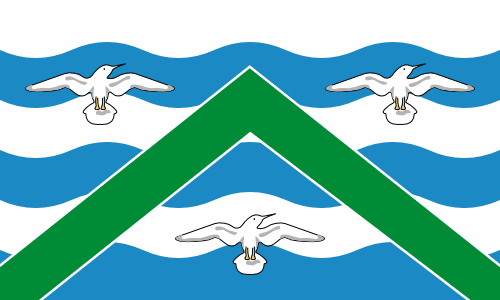 I rescued the thunderbird from previous flag, in turquoise color and less stylized. 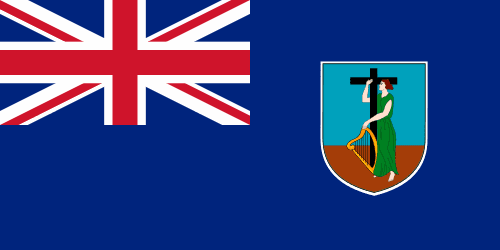 The new flag has a better color layout, and I don't think it looks any bad. 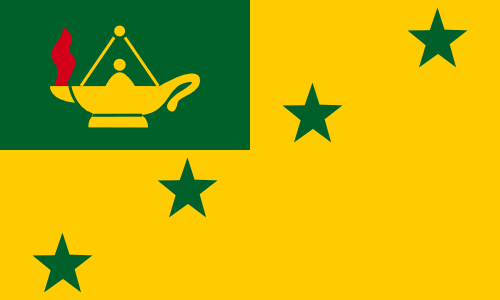 More about Gabe Re's design here. Quite boring, isn't it? 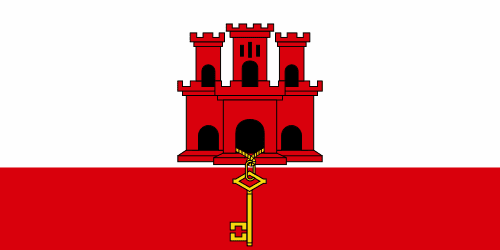 So today I'll present my proposal for the fifteen! 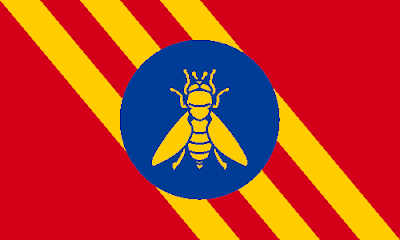 Some of the designs are mine, others aren't (when noted). 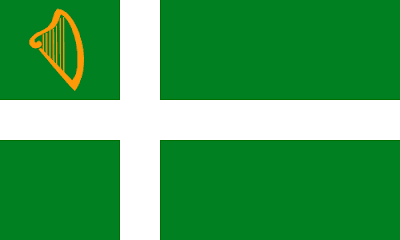 My design for Akroitiri and Dhekelia is inspired by the Dhekelia Garrison's flag. For difference, I've added the colors of British Ministry of Defence, to show it's a military base. 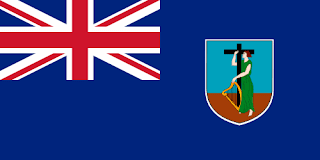 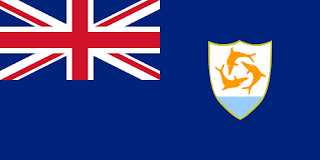 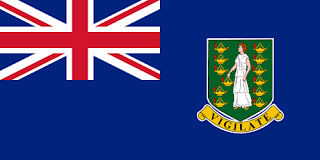 My proposal for Anguilla is actually a rip-off of Republic of Anguilla (1967-1969) flag i.e. 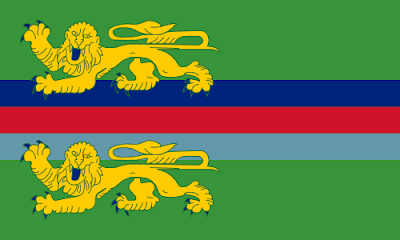 a banner of current arms. 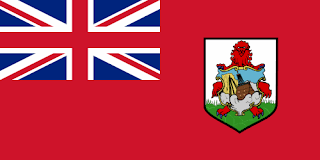 For Bermuda, I picked the lion and red of current flag (both representing British influence) but put the lion's face on a triangle, a reference to famous Bermuda's triangle. My British Antarctic Territory flag proposal is based on coat of arms, too. I put the blue stripes on center and made the white background shine. 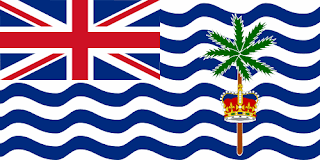 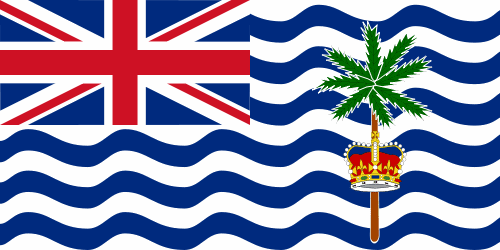 For British Indian Ocean Territory, I picked the flag of Chagossians (natives) in exile and put the palm tree and crown from current design. 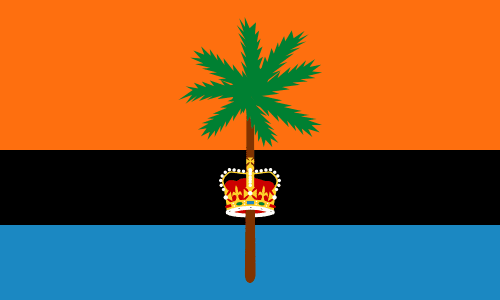 Some minor details is that I put the crown crossing the tree and centered in black stripe, for better aesthetics. 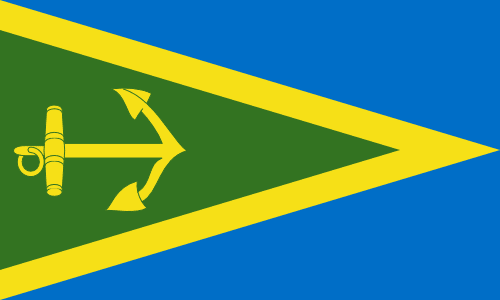 This is one of my favorite flags in the series. 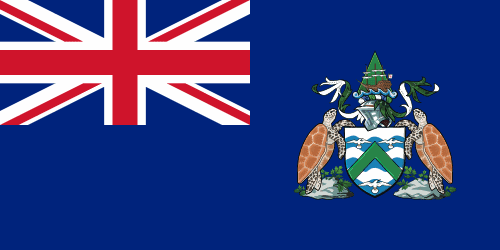 Also original is my flag for the British Virgin Islands. 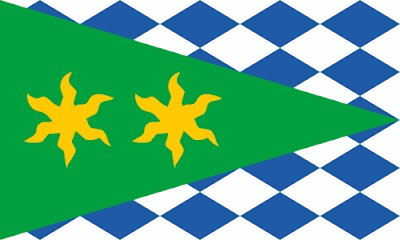 The lamp refers to Saint Ursula and the 11,00 martyred handmaidens that give the islands its name. 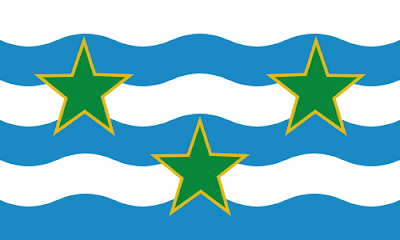 The four stars represent the four main islands: Tortola, Virgin Gorda, Anegada and Jost Van Dyke. 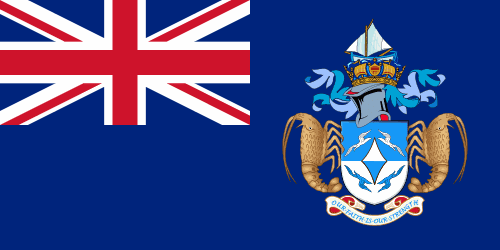 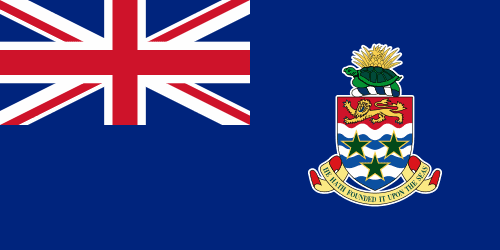 My proposal for Cayman Islands is a simplification of current coat of arms; this design, actually, was reportedly once used by independentist movement. 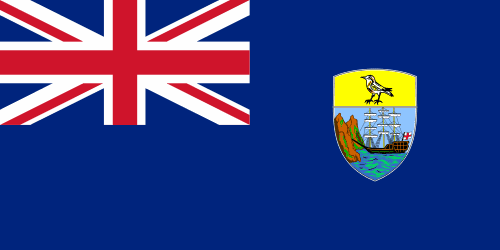 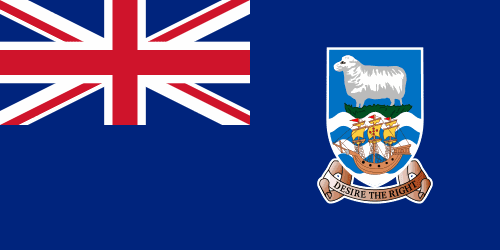 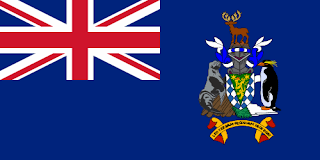 My flag for Falkland Island is freely inspired in the coat of arms. 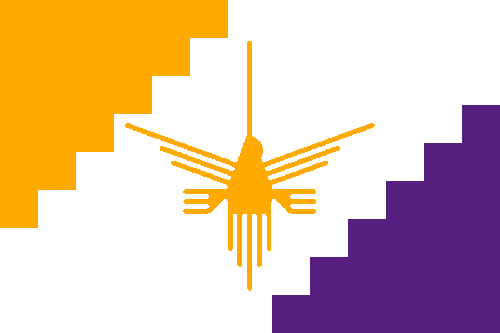 I removed the ship and shifted the flag for the hoist for aesthetic reasons. Another of my favorite design on the series is that of Pitcairn. 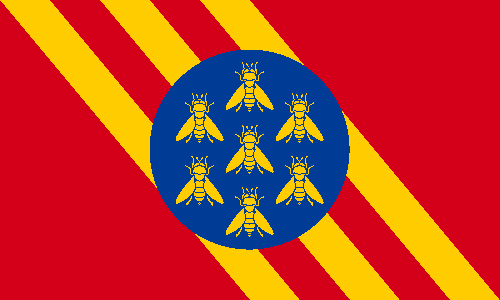 It's, basically, a rotated and simplified version of the coat of arms. 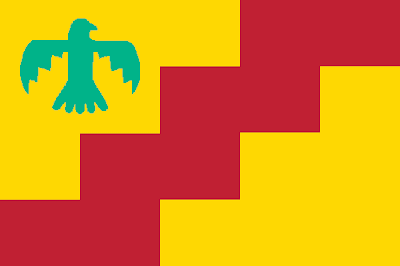 For Saint Helena, I kept the symbol bird of the territory, but added a cross in red and yellow in reference to Byzantine empress Saint Helena, that, according to tradition, found the True Cross. 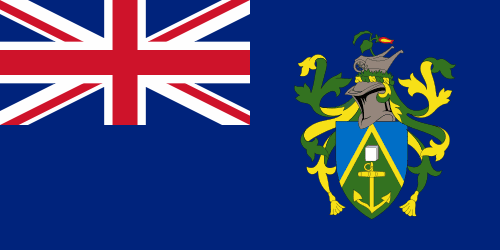 I rotated and simplified the coat of arms of South Georgia and South Sandwich Islands. Now, the two wavy stars represent both James Cook and the two island chains (South Georgia and South Sandwich) that gives the territory its name. Finally, my proposal for Turks and Caicos. 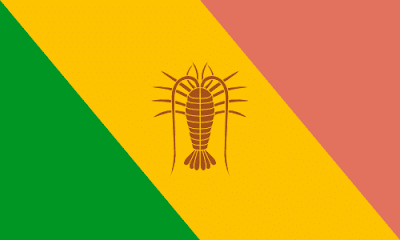 I couldn't satisfactorily harmonize the three charges of its coat of arms, so I used yellow for sand, green for the flora, pink for the shell and the flamingoes and a lobster as lone charge. 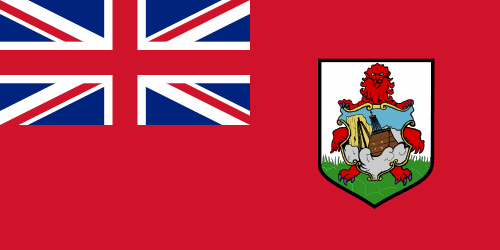 Sorry for the delay; I hope the long post is enough sorry. 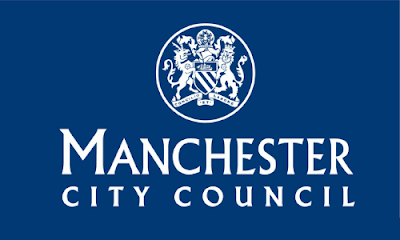 The city of Manchester is one of most important in United Kingdom. 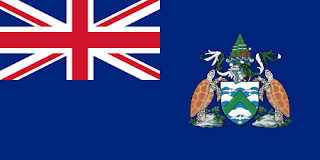 But, after a quick internet search, I couldn't find any instance of a related flag. 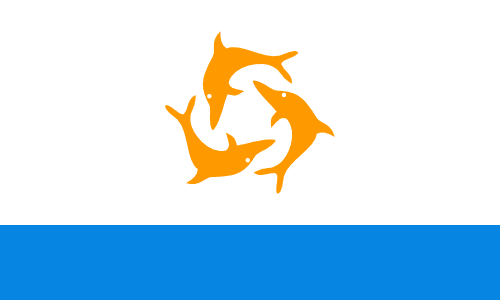 So I decided to propose one design by myself. The three diagonal stripes represent the three rivers that cross the city: Irwell, Irk and Medlock. 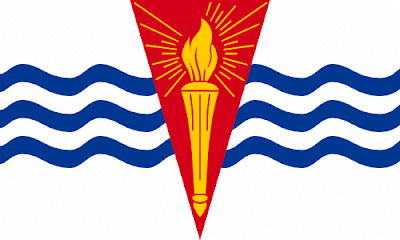 The blue glode represents the role of world-level trade center. 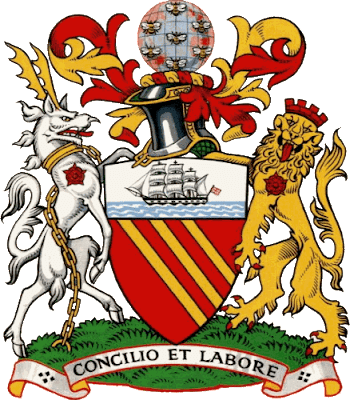 The worker bees is commonly used as a Mancunian symbol as the birthplace of Industrial Revolution. One thing that I like in the designs (my favorite is still the first) in the circle incidentally tangential to the thicker diagonal stripe formed by the three thin diagonal stripes and their interspaces. 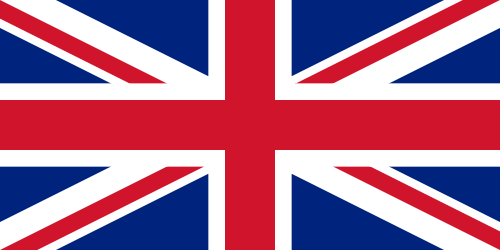 Sorry for the delay in publishing this post.